BACKGROUND AND PURPOSE: The imaging appearance of chronic, partially recanalized dural sinus thrombosis has been incompletely described. 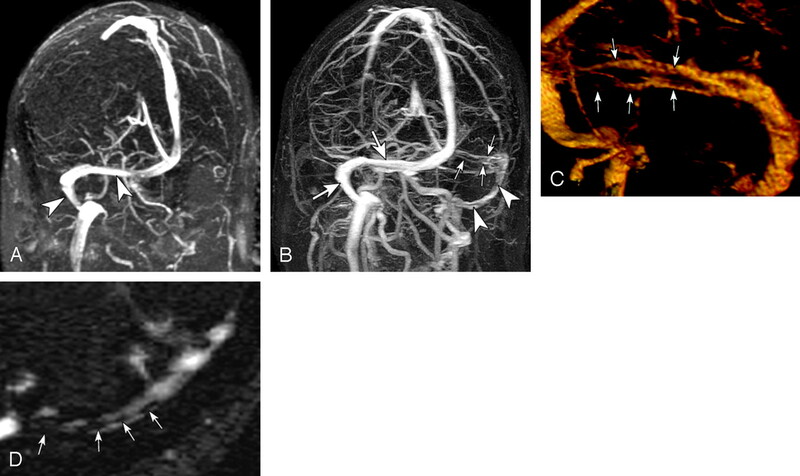 We sought to more fully characterize the imaging findings of this entity on MR imaging, time-of-flight MR venography (TOF-MRV), and elliptic centric-ordered contrast-enhanced MR venography (CE-MRV). Materials and METHODS: From a data base of patients with cerebral venous thrombosis, 10 patients were identified with imaging and clinical findings consistent with the diagnosis of chronic, partially recanalized, dural sinus thrombosis. All patients had MR imaging of the brain without and with contrast. Nine patients underwent MRV, and 6 had both CE-MRV and TOF-MRV. Thirty-four venous segments were thrombosed and were assessed in detail for multiple imaging features. RESULTS: Most thrombosed segments were isointense to gray matter on T1-weighted images (85%), and hyperintense to gray matter on T2-weighted images (97%). Visible serpiginous intrathrombus flow voids were visible in 23 segments (8/10 patients) corresponding with areas of flow signal intensity on TOF-MRV and enhancing channels on contrast MRV. Eighty-four percent of thrombosed segments enhanced equal to or greater than venographically normal venous sinuses. TOF-MRV and CE-MRV were abnormal in all patients, and CE-MRV more completely characterized the thrombosed segments. The imaging appearance did not change in those patients with follow-up imaging (average 13.6 months). CONCLUSION: Chronic, partially recanalized, venous thrombosis has a characteristic appearance on MR and MRV. CE-MRV was abnormal in all cases, despite the intense enhancement of the thrombosed segments. Because of the highly selected nature of the cases reported, further study is required to determine whether these findings are present in all cases of this condition. Cerebral venous thrombosis (CVT) is a relatively uncommon disorder with an estimated annual incidence of between 2 to 7 cases per million population per year.1 Accurate, timely diagnosis (usually performed by MR imaging) is essential to direct appropriate therapy.2 The diagnosis of venous thrombosis by MR imaging can be difficult because temporal evolution of thrombus and recanalization effects can result in a variable MR appearance.3 This is particularly true with respect to chronic, partially recanalized dural sinus thrombosis, which can be inaccurately diagnosed given its propensity to enhance intensely and mimic sinus patency.4 Because of this intense enhancement, the accuracy of contrast-enhanced MR venography (CE-MRV) techniques has been questioned.4,5 Despite the confusing imaging manifestations of chronic partially recanalized dural sinus thrombosis, only 1 prior study has specifically evaluated this condition.4 Our study was performed to more accurately describe the appearance of chronic dural sinus thrombosis on MR imaging, assess findings on CE-MRV, and represents the first study, to our knowledge, to provide a detailed correlative assessment of MR imaging time-of-flight MR venography (TOF-MRV), and CE-MRV in this condition. An ongoing data base of cases of cerebral venous thrombosis was created in 2002, after Institutional Review Board approval. A keyword search of imaging reports for the terms “cerebral venous thrombosis” and “dural sinus thrombosis” was used, and a total of 30 cases of cerebral venous thrombosis were identified, imaged by MR from 1999 to 2005. From these 30 cases, a subset of 10 cases were identified that had clinical and imaging features consistent with chronic or partially recanalized venous thrombosis. Case selection was based upon clinical and imaging criteria. These criteria included: intensely enhancing sinus lumen with abnormal MR signal intensity indicating absence of normal flow (features of chronic thrombosis described previously by Dormont et al4), MR venographic findings of occlusion or incomplete recanalization, known prior thrombosis with incomplete recanalization, or clinically referable symptom duration for greater than 10 days. Patients with symptoms of less than 10 days’ duration were excluded from selection. In no patient was the diagnosis of chronic thrombosis made solely by MRV. Abnormal intrasinus signal intensity was present in all venographically abnormal segments. This prevented hypoplastic but normal sinus segments from being incorrectly categorized as thrombosed. Nine patients were imaged on a 1.5T scanner (Signa Horizon 5x, Signa Horizon 9.1x, Signa Horizon CVi; GE Healthcare, Milwaukee, Wis), and 1 patient was imaged on a 0.3T scanner (AIRIS II; Hitachi, Tokyo, Japan). Standard images assessed at 1.5T included an axial fast spin-echo (FSE) T2-weighted sequence (TR, 3000–4000 ms; TE, 80–123.6 ms; ETL, 12), an axial fluid-attenuated inversion recovery (FLAIR) sequence (TR, 10002–10004 ms; TE, 123.4–142 ms; TI, 2200 ms), a gradient recalled-echo (GRE) sequence (TR, 650 ms; TE, 28 ms; flip angle [FA], 25°), and an axial spin-echo (SE) T1-weighted sequence (TR, 350–400 ms; TE, 8–9 ms). Section thickness was 4 mm with no intersection gap for all patients. For the one examination performed at 0.3T, imaging parameters included axial SE T2-weighted sequence (TR, 2800 ms; TE, 90 ms); axial proton attenuation sequence (TR, 2800 ms, TE, 25 ms); and an axial T1-weighted sequence (TR, 500 ms, TE, 20 ms). Section thickness was 5.0 mm with an intersection gap of 1.0 mm. All patients had postcontrast axial and coronal T1-weighted imaging, either immediately after CE-MRV (6 patients) or after hand injection of 0.1 mmol/kg of gadolinium (4 patients). Section thickness and imaging parameters were the same as precontrast imaging. Scan delay after gadolinium injection was typically 1 minute (for patients imaged without concomitant CE-MRV), or 4 minutes (for studies done after CE-MRV). Nine patients underwent MR venography, all performed at 1.5T. Six patients were imaged with both TOF-MRV and CE-MRV, and 3 were imaged by TOF-MRV only. TOF-MRV was performed in both direct axial and direct coronal acquisitions. An inferior saturation pulse was used to diminish arterial signal intensity. Imaging parameters included: matrix, 256 × 128; FOV, 22 cm; section thickness, 1.5 mm; FA, 50°; bandwidth (BW), 15.63 kHz. Standard maximum intensity projection (MIP) images were performed with right to left and anterior to posterior 180° rotations. CE-MRV was performed using an elliptic centric-ordered acquisition with a modification of a technique described previously.6 Typical imaging parameters included: echo-spoiled gradient echo sequence; TR, 7.0 ms; TE, minimum (1.3 ms); FA, 35°; matrix, 320 × 320; FOV, 25 cm; section thickness, 1.3 mm; NEX, 1.0; BW, 62.50 kHz; elliptical centric encoding; imaging time, 3 minutes 24 seconds. Scanning was performed in the sagittal plane from ear to ear. A total of 30 mL of intravenous gadolinium was injected at rate of 3.0 mL/s. The MRV acquisition was initiated after a 21-second delay after the end of intravenous contrast injection (empirically determined at our institution to provide optimum venous contrast in most patients). All images were of excellent diagnostic quality. MIPs were performed in all cases for standard diagnostic use with both anteroposterior and medial-lateral 180° rotations. Because of the inherent heterogeneity of the appearance of venous thrombosis, a segment approach was used in which the cerebral venous system was divided into these segments for separate evaluation: anterior (horizontal) superior sagittal sinus, posterior (vertical) superior sagittal sinus, torcular herophili (sinus confluence), medial transverse sinus (proximal to vein of Labbé or tentorial sinus entry site), lateral transverse sinus (distal vein of Labbé or tentorial sinus entry site to the sigmoid sinus), sigmoid sinus (defined as the vertical sinus at the level of the petrous bone to the jugular bulb), and jugular vein. Each thrombosed segment was evaluated by 2 radiologists (J.L.L., W.M.S.) for several features, including dominant signal intensity relative to normal gray matter, presence of signal intensity voids (areas of diminished signal intensity corresponding to flow containing channels on MRV), overall enhancement level (less than, equal to, or greater than venographically normal dural sinuses), morphology of sinus signal intensity (homogeneous, heterogeneous), location of recanalized channels (peripheral or central), presence of filling defects on postcontrast images, and MRV appearance. Both axial and coronal TOF-MRV source images were assessed. The scan plane most perpendicular to the direction of flow, or the acquisition on which the morphology of the recanalized channels was best visible, was used. CE-MRV source and MIP images were evaluated. More detailed MRV evaluation of each thrombosed segment was also performed on a separate workstation (Vitrea 2; Vital Images, Minnetonka, Minn). MRV images were reformatted to match the exact image plane of the axial standard parenchymal images for detailed correlation. Additional focused MIP, volume-rendered, and multiplanar reformatted images were performed as necessary to understand the 3D appearance of the thrombosed segments. There were 6 men and 4 women with an average age of 49 years (range, 23–76 years) in the study population (Table 1). Eight patients were diagnosed initially in the chronic partially recanalized stage. Two patients were identified during follow-up of previously known acute venous thrombosis. Symptoms included headache (5 patients), vertigo/dizziness (2 patients), seizures (1 patient), and right-sided sensory loss (1 patient). In 1 patient, thrombosis was identified on routine imaging follow-up after metastatic tumor resection. This patient had no acute symptoms. Accurate, referable, well-defined symptom onset information was available in 5 patients. Average clinical thrombus age (time of onset of relatable symptoms until imaging) was 73.6 days, with a range of 10–198 days in these patients. In 3 patients, long-term symptoms were present (more than 30 days to 10 years) but without a clearly defined onset. Although these patients exhibited chronic symptoms, they were not included in analysis of symptom onset timing. In 1 patient, the duration of symptoms was not obtainable from the medical record. A total of 34 thrombosed venous segments were identified in 10 patients in these locations: horizontal superior sagittal sinus (2), vertical (posterior) superior sagittal sinus (1), torcular herophili (1), medial transverse sinus (7), lateral transverse sinus (9), sigmoid sinus (7), and jugular bulb (7) (Table 1). No case with deep venous or cortical venous thrombosis was present in the study group. Signal intensity of intraluminal thrombus is given in Table 2. Most thrombosed segments were hyperintense on T2-weighted images (T2WI) (33/34, 97%) and isointense on T1-weighted images (T1WI) (29/34, 85.3%). No thrombosed segment exhibited hypointensity or susceptibility effect on GRE images. Signal intensity on FLAIR and proton attenuation weighted images closely followed signal intensity on T2WI, with 32 of 34 (94.1%) segments exhibiting hyperintense signal intensity. Thrombus appearance was variable. Eighteen segments demonstrated heterogeneous signal intensity related either to signal intensity variations within the thrombus or to the presence of internal flow voids. Sixteen segments exhibited homogenous internal signal intensity with little signal intensity variability. There was a segmental difference in thrombus morphology with the medial transverse sinus more commonly homogenous in signal intensity (6/7 segments, 86%), relative to the lateral transverse and sigmoid sinuses (7/16 segments, 44%). Eight of 9 (89%) thrombosed lateral transverse sinus segments exhibited heterogeneous thrombus morphology. Internal flow voids (areas of markedly diminished serpiginous signal intensity, best characterized on T2WI, correlating with flow signal intensity or enhancement on MRV images) were present in 23 of 34 segments (68%) (Figs 1 and 2). Flow voids were more commonly visualized within the lateral transverse sinus, sigmoid sinus, and jugular bulb (22/23 segments, 96%) relative to the superior sagittal sinus, torcular herophili, and medial transverse sinus (1/11 segments, 9%). Partially recanalized thrombosis of the left sigmoid sinus: 47-year-old man with 45-day history of headache (patient 3). Shown are an axial FSE T2-weighted image (T2WI) (A), an axial SE T1-weighted image (T1WI) (B), an axial SE T1WI after contrast (C), a source image from axially acquired TOF-MRV (D), an axial reformatted source image from CE-MRV (E), and a lateral projection volume rendered image from CE-MRV (F). The signal intensity of the thrombus was heterogeneous and primarily hyperintense relative to gray matter on T2WI (arrowhead, A), and isointense on T1WI (arrow, B). Flow voids were identified on parenchymal sequences (arrows in A–C) that correspond to recanalized channels on MRV techniques (arrows in D and E). Areas of thrombus were seen as regions of signal intensity void on the MRV images (arrowheads, D and E). Note that the channels are slightly larger and more ill-defined on CE-MRV (arrows, E). The thrombus enhances intensely after contrast administration (arrowhead, C). The recanalized channels are well seen on CE-MRV volume-rendered images (arrows, F). Filling defects consistent with thrombus are identified in among the recanalized channels (arrowheads, F). Evolution of acute thrombosis: 43-year-old woman (patient 4) presented for imaging 2 days after onset of severe headache (A–C). Shown are follow-up imaging 197 days later (D–F), axial FSE T2-weighted images (A and D), axial SE T1-weighted images after contrast (B and E), and source images from axially acquired TOF-MRV. On the initial MR (C and F), acute thrombus was identified within the distal transverse and proximal sigmoid sinus. The thrombus was hypointense on T2-weighting (arrows, A) and isointense on T1-weighted images, without enhancement (arrows, B). The thrombosed portions of the sinus exhibited no flow-related signal intensity on TOF-MRV (arrows, C). Some minimal flow signal intensity was seen surrounding the thrombus (arrowhead, C), likely related to collateral flow within dural cavernous spaces or peripherally within the sinus. On the follow-up examination, a central flow void had formed on T2WI and postcontrast T1WI consistent with a recanalized channel (arrows, D and E). Peripheral heterogeneous isointense to hyperintense signal intensity is seen (arrowheads, D), enhancing on postcontrast T1-weighting (arrowheads, E), without flow-related signal intensity on TOF-MRV (arrowheads, F), consistent with enhancing chronic thrombus. The central channel exhibits marked flow-related signal intensity on TOF-MRV (arrow, F). Thirty-two thrombosed segments were evaluated after the administration of contrast. Most (27/32, 84.4%) enhanced to an equal or greater degree than the same adjacent or contralateral dural sinus segments, shown to be normal on MR venography (Table 2). Fifteen segments enhanced homogeneously, and 17 segments enhanced in a heterogeneous fashion (Figs 1 and 2). A heterogeneous appearance after gadolinium administration was more common in the lateral transverse sinus, sigmoid sinus, and jugular bulb (15/17 heterogeneous segments, 88%) relative to the superior sagittal sinus and medial transverse sinuses (2/17 heterogeneous segments, 12%). Heterogeneity was related to hypoenhancing thrombus and intrinsic flow voids in each segment. TOF-MRV was performed in 9 patients (31 venous segments). CE-MRV was performed in 6 patients (21 venous segments), all of whom had TOF-MRV performed during the same examination. In all thrombosed segments evaluated by MRV, both TOF-MRV and CE-MRV were abnormal (Figs 1 and 3). Partially recanalized thrombosis of the left transverse and sigmoid sinuses (patient 6). Shown are a TOF-MRV oblique MIP (A), a CE-MRV oblique MIP (B), a local oblique volume rendered CE-MRV image (C), and an axial reformatted source image from CE-MRV (D). No flow signal intensity was identified on TOF-MRV within the thrombosed left transverse and sigmoid sinuses (A). There was normal flow-related signal intensity in the right transverse and sigmoid sinuses (arrowheads, A). The morphology of the partially recanalized sinuses is better depicted on CE-MRV (B). Small irregular recanalized channels were seen within the left transverse sinus (small arrows, B). The sigmoid sinus opacifies more completely; however, focal and linear irregular filling defects are visualized (arrowheads, B). The left transverse and sigmoid sinuses enhance less prominently than the normal right transverse and sigmoid sinuses (large arrows, B). The small irregular recanalized channels are even better depicted on a detailed volume-rendered representation (arrows, C). 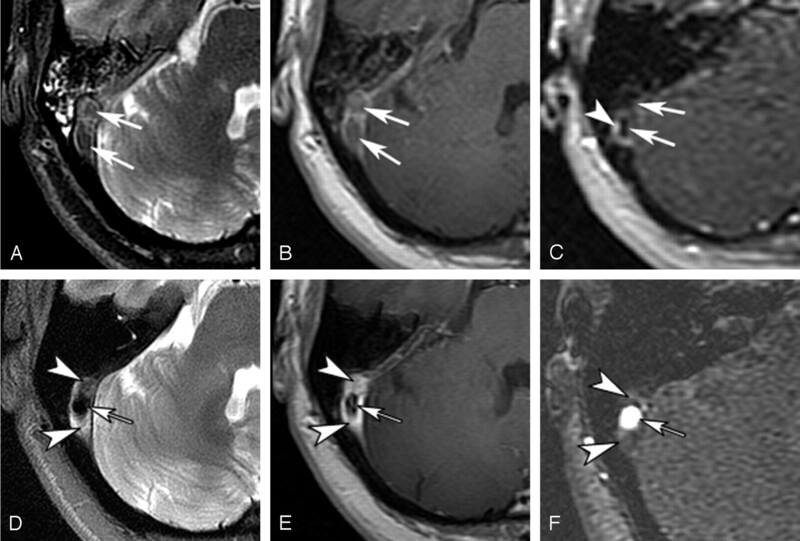 Reformatted axial images from the CE-MRV demonstrate internal filling defects within the left transverse sinus, consistent with hypoenhancing thrombus (arrows, D). Recanalized channels were assessed on TOF-MRV by morphology (continuous or discontinuous) and location (peripheral or central) relative to the dural sinus margins. (Table 3). Eight segments had no visible flow signal intensity. Most segments exhibited continuous recanalized channels with a primarily peripheral orientation (18/31 segments, 58.1%; Table 3). On CE-MRV, 3 patterns were observed that correlated well with the TOF-MRV appearances. Peripheral enhancement with central nonenhancing filling defect (15 segments), heterogeneous enhancement with irregular central and peripheral small filling defects (4 segments), and a central enhancing channel with peripheral filling defects (2 segments) (Table 3). There was good correlation with TOF-MRV with 10/15 peripheral enhancement morphology segments exhibiting peripheral continuous channel morphology on TOF-MRV. Three peripheral enhancement segments exhibited no flow signal intensity on TOF-MRV. The additional 2 peripheral enhancement segments exhibited irregular discontinuous channels and central and peripheral continuous channel morphology on TOF-MRV. All heterogeneously enhancing segments with irregular filling defects exhibited central and peripheral channels on TOF-MRV, and both centrally enhancing segments exhibited central recanalized channels on TOF-MRV. In the 8 segments that had no visible flow on TOF techniques, there was peripheral enhancement with clearly defined peripheral channels and central filling defects demonstrated on CE-MRV (Fig 3). In segments exhibiting clearly defined channels on TOF-MRV, the same channels were visible and were always larger and more ill-defined on CE-MRV (Fig 1). The overall venous morphology was better characterized on CE-MRV in each segment. In 7 of 21 segments evaluated by CE-MRV, areas of enhancement were identified that did not correlate with areas of flow signal intensity on TOF-MRV or flow voids on T2WI. In these regions, enhancement was less than that seen in the areas of definite flow signal intensity on TOF-MRV. Because of extensive recanalized channels in some segments, evaluation of the projected CE-MRV MIP images could mimic patency. However, in all thrombosed segments evaluated by CE-MRV in this study, projected CE-MRV MIP images demonstrated asymmetric diminished enhancement, irregular morphology, or visible filling defects (Fig 3). Two cases were identified on follow-up of previously identified thrombosis. In 1 patient, initial imaging was performed 4 days after symptom onset and, in the other, 2 days after symptom onset. In both cases, the initial MR imaging demonstrated findings consistent with acute thrombosis (Fig 2). Follow-up imaging (scans used in evaluating the partially recanalized thrombosis) was performed 51 days after initial diagnosis (55 days after symptom onset) and 196 days after initial diagnosis (198 days after symptom onset). These cases demonstrated typical features of chronic thrombosis with recanalized channels and enhancing and nonenhancing chronic thrombus (Fig 2D–F). There was no change on longer term follow-up (199 and 500 days after symptom onset, respectively). Seven patients had follow-up imaging after initial diagnosis of chronic thrombosis (average time, 13.6 months). Five patients had follow-up MR imaging (5–27 months; average, 14.6 months), 5 had follow-up TOF-MRV (5–30 months; average, 10.6 months), and 2 patients had follow-up CE-MRV (5–10 months; average, 7.5 months). There was no change in the MR or MRV appearance of the thrombosed segments on any follow-up examination. Two patients had standard 3D TOF-MR angiography examinations that covered the region of sinus thrombosis. No abnormal flow-related signal intensity was demonstrated in the thrombosed segments to suggest dural arteriovenous fistula. There were no prominent cortical veins, leptomeningeal vascular enhancement, or areas of persisting brain parenchymal signal intensity abnormalities. No patient in this study had contrast-enhanced CT imaging, CT venography, or angiographic evaluation because the diagnosis was clear based upon MR imaging. Chronic, partially recanalized dural sinus thrombosis has a typical abnormal imaging appearance. The thrombosed segments are most commonly isointense on T1-weighted sequences, and hyperintense on FLAIR and T2-weighted sequences. The thrombosed segments enhance intensely and can demonstrate internal flow voids, best seen on T2WI. Chronically thrombosed segments can be demonstrated well on both TOF-MRV and CE-MRV (using elliptic centric k-space encoding). Based upon our study, 3 major components of chronic partially recanalized thrombosed segments are proposed. Areas exhibiting no signal intensity on TOF-MRV, intense enhancement on post contrast T1WI, and showing no or diminished enhancement on CE-MRV relative to flowing channels. No signal intensity on TOF-MRV, no or significantly diminished enhancement on postcontrast T1WI or CE-MRV. Flow void on MR images (best delineated on T2WI), flow-related signal intensity on TOF-MRV, flow void or intense enhancement on T1-post contrast images, and intense continuous enhancement on CE-MRV. In the limited number of cases of chronic thrombosis described in the literature the internal signal intensity is typically isointense to hyperintense on T2WI and isointense on T1WI,4,8,9 although they can be variable.9 In this study, most (97%) of chronically thrombosed segments appeared markedly hyperintense relative to brain on T2WI. This bright signal intensity probably relates to the vascularized connective tissue thrombus components or potentially slowly flowing oxygenated blood within small recanalized channels within the thrombus. Of interest is the lack of susceptibility effect demonstrated on GRE sequences in our cases of chronic sinus thrombosis. Recent reports of cerebral venous thrombus signal intensity on GRE sequences have described significant vascular thrombus susceptibility effects.10,11 These reported cases however were either in cases of less than 9 days clinical thrombus age,10 or uncertain thrombus age.11 It is possible that macrophage activity, occurring during thrombus organization,7 results in significant removal of blood breakdown products in the chronic stage. In a more recent study,12 venous thrombus susceptibility effects were more frequent in thrombosed segments with a clinical thrombus age of 0–7 days (90.6%) than in segments with a thrombus age of 8 days or greater (23.3%). The partially recanalized segments can exhibit intense enhancement in the chronic stage, probably as a result of the vascularization of chronic thrombus.4 In our study, 88% of thrombosed segments enhanced equal to or greater than venographically normal sinus enhancement. Our results also suggest that some of the enhancement on postcontrast T1WI may also be secondary to slowly flowing blood in small recanalized channels. Some of these may be visible on TOF-MRV as flow signal intensity, enhancing zones on postgadolinium T1WI, and enhancing regions on CE-MRV. Some recanalized channels may be very small,7 below the resolution of MR imaging techniques, and only demonstrated as areas of enhancement. It is important to note that thrombus enhancement may be mistaken for normal sinus opacification if other features of chronic thrombosis are not recognized or venographic techniques are not used. We observed flow voids in most of the thrombosed segments on standard imaging sequences, a feature that has not been previously emphasized in the literature. These correlated with areas of flow signal intensity on TOF-MRV and enhancing channels on CE-MRV and were much more common in the lateral transverse and sigmoid sinuses, segments that also enhanced more heterogeneously. The thrombus formation within the more proximal transverse sinus and superior sagittal sinus was more homogeneous, with fewer hypoenhancing areas, more homogeneous signal intensity, and less visible flow voids. The MRV appearance in these segments was also different with smaller recanalized channels. The reason for this difference may be related to cortical venous inflow and collateralization effects. Increased numbers of recanalized channels are identified in our study in segments distal to the entry site of the vein of Labbé and lateral tentorial sinus (lateral transverse sinus, sigmoid sinus). Inflow from cortical veins may promote the formation of recanalized channels in these segments. Sinus thrombosis can be well imaged by both TOF-MRV and CE-MRV.9 TOF-MRV is a flow sensitive technique and many pitfalls associated with this technique are related to in-plane saturation or turbulent flow effects.9,13 CE-MRV is a more flow insensitive technique relying on vascular enhancement for vessel detection. The contrast-enhanced technique used in this study uses high spatial resolution with elliptic centric ordering of phase encoding to ensure that low spatial frequency areas of k-space (important for contrast resolution) is acquired when the concentration of vascular contrast is greatest, increasing vascular-to-tissue signal intensity ratios.6 This technique has been shown to provide much better depiction of normal venous structures relative to TOF-MRV,6 but has not been assessed for depiction of chronic thrombosis. The utilization of contrast-enhanced MRV techniques in the diagnosis of chronic thrombosis has been questioned as potentially inaccurate in this stage given the intense thrombus enhancement.4,5,14 A prior study using magnetization-prepared rapid acquisition of gradient-echo 3D CE-MRV demonstrated that chronic thrombus can be missed on contrast-enhanced MR techniques.5 In the 6 patients with chronic thrombosis in this study, 4 were misdiagnosed as normal and 2 were given the diagnosis of “thrombus probably present.” The sinuses enhanced prominently, leading to misdiagnosis. The scan times in this study were between 6 and 7 minutes, and the acquisitions were not timed to coincide with vascular phase contrast enhancement. Based upon our experience, CE-MRV, imaging in peak venous enhancement phase, can accurately depict recanalized channels and morphology of partially recanalized chronically thrombosed dural sinus segments. CE-MRV (relative to TOF-MRV) more accurately depicts recanalized channel morphology and produces a clearer picture of the degree of patency of thrombosed segments. The CE-MRV technique used in our cases used an elliptic centric technique that minimizes the possibility of detection of extravascular contrast. All thrombosed segments were easily noted as abnormal by CE-MRV in our study. Some of the enhancing regions visualized on CE-MRV may represent either very slow flow within recanalized channels (below the detection ability of TOF-MRV secondary to turbulence, flow direction, or flow velocity effects), or early thrombus enhancement. Given that our CE-MRV acquisitions were obtained with more of a delay time than the initial reports of this technique, the latter is possible. This may also be a reason that the channels appeared larger on CE-MRV, and that areas of enhancement were seen in some segments not correlating with flow voids or visible channels on TOF-MRV. With earlier timing (using either MR fluoro visual triggering, or arterial MR signal intensity triggering), this may be less of an issue. Unfortunately, the time it takes after administration of intravenous contrast for chronic thrombus to exhibit significant enhancement is currently unknown. It seems prudent to perform both TOF-MRV (flow assessment) and CE-MRV (vascular morphology assessment) to provide the most complete picture of recanalized segments in these patients. Our current MR protocol for assessment of venous thrombosis includes standard MR imaging of the brain without and with contrast, TOF-MRV, and CE-MRV. To our knowledge, no prior study has evaluated the relative abilities of TOF-MRV, CE-MRV, and CT-venography in detecting cerebral venous thrombosis or the ability of CT-venography to detect, and correctly characterize, recanalized chronic cerebral venous thrombosis. Based upon our experience with CE-MRV, CT-venography should be able to depict chronic, partially thrombosed venous segments if scanning is performed in peak venous phase before significant contrast enhancement of the thrombus can occur. Further evaluation of CT-venography in this condition appears warranted. In patients with follow-up MR and MRV imaging, there was no change in the appearance of the thrombosed segments. Recent prospective clinical studies have demonstrated that in patients with acute sinus thrombosis, most recanalization occurs within the first 3 weeks of anticoagulation therapy, and further recanalization after 4 months of therapy rarely occurs.15,16 Our study also supports the idea that if there is no recanalization after an initial evolution stage, there will be no further change in the morphology of the thrombus. No treatment guidelines have been established based upon venous thrombus appearance on MR imaging. Whether the imaging appearance of chronic thrombus can guide therapy requires further study. The variable clinical and imaging follow-up is a limitation to this study, as is selection bias. The cases were selected in part by imaging criteria, though clinical exclusion criteria were also used. Imaging criteria were based upon the literature and our group's extensive experience in assessing cases of venous thrombosis.9 The finding of nearly identical appearances of the 2 cases of known previous acute thrombosis, and the other cases presented in this article, as well as the appearance similar to that of the small number of previously described cases, support the idea that the appearance described is typical. The highly selected nature of our cases precludes generalization to all cases of partially recanalized chronic thrombosis. A prospective, defined-interval, follow-up study of all cases of acute sinus thrombosis would be necessary to outline in more detail whether this appearance is characteristic for all cases of chronic thrombosis and is a goal of further research. Furthermore, no angiographic or CT venographic correlation exists for our patients, which would be optimal to assess the relative diagnostic abilities of these techniques. The imaging appearance in our cases may overlap with the appearance of dural arteriovenous fistula (DAVF),21 which is not surprising, given that the cause of many DAVFs may be episodes of prior dural sinus thrombosis.22 3D TOF-MRA was performed in 2 patients and did not demonstrate any evidence of fistula. The lack of findings of venous hypertension within the parenchyma, lack of prominent cortical veins, and the absence of suggestive clinical findings make the diagnosis of DAVF unlikely. The lack of angiographic correlation makes it impossible to totally exclude coexistent small DAVFs in these patients. Chronic, partially recanalized dural venous thrombosis has a typical appearance on MR imaging that should be distinguished from normal flow states. Chronic thrombus is typically hyperintense on T2WI, isointense on T1WI, enhances intensely after the administration of intravenous contrast administration, and may have discrete flow voids visible, particularly on T2WI. Because of the intense enhancement venographic techniques are often necessary for confident diagnosis. TOF-MRV and CE-MRV were abnormal in all cases with irregular recanalized channels visible. 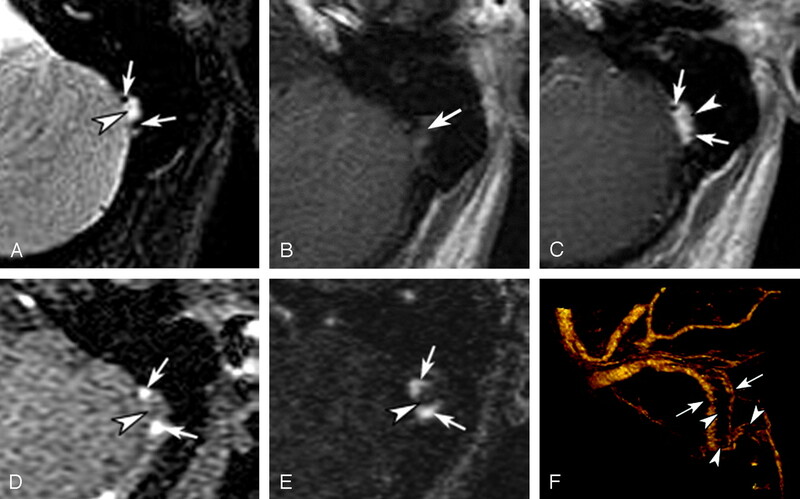 The morphology of the thrombosed segments does not change on follow-up imaging. Because of the highly selected nature of the cases reported, further study is required to determine whether these findings are typical for all cases of chronic, partially recanalized chronic sinus thrombosis. Whether identification of findings typical of chronic, partially recanalized, dural sinus thrombosis on MR imaging and MRV can guide therapy requires further study. Accepted after revision September 11, 2006.